We are located in the Town of Masaka. Our parents, Bryan & Cheri Stensaas established churches in the towns of Mbarara & Soroti. My youngest brother, Andrew Stensaas & his family established a church in the town of Mbale, while my other brother, Matt & his family are located in Kasese Town (about one hour drive south of Fort Portal next to Lake George) and have established a church there. **You will notice that every time we go to the capitol to shop for supplies, we pass over the Equator. It takes approximately two and one half hours to travel from Masaka to Kampala. 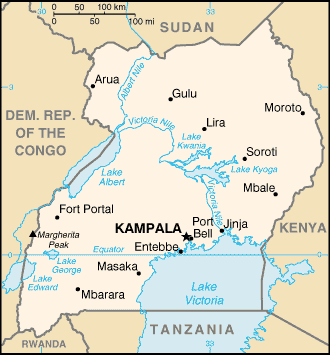 Uganda takes its name from the Buganda kingdom, which encompasses a portion of the southern country including the capital Kampala. 38% of the population of the country lives slightly below the international poverty line of US $2.00 a day at $1.25 per day. The average monthly income is $86.